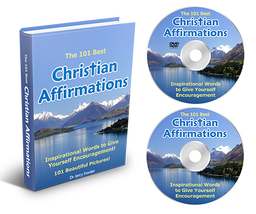 Available - Christian Affirmations eBook, MP3, & Video files!! Backed by 101 of the most Encouraging and Inspirational Bible Verses! You get Christian Affirmations for Goals, Dreams, Health, Healing, Financial Blessings, Prayer, Self Esteem, Inner Peace, Happiness, Hope, Faith, Wisdom, & More! Replace Negative Thinking with Positive Christian Affirmations!